The Mule 600 2x4 are highly versatile all terrain vehicles that can be used in a variety of applications requiring speed, manoeuvrability and the ability to transfer equipment quickly and efficiently. Available from Kawasaki , the all terrain vehicles' lightweight nature and low ground-pressure tyres avoid damage to sensitive areas such as golf fairways, parkland or recreational areas. 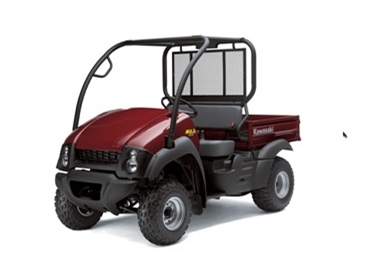 The Mule 600 2x4 is powered by a powerful Kawasaki 401cc, four-stroke, OHV, air-cooled engine. The engine is lightweight and durable, having evolved from Kawasaki’s long line of agricultural ATVs. Updated styling with curved surfaces and powerful lines gives the Mule 600 all terrain vehicles a more voluminous appearance. The dual-mode rear differential function enables locking for high traction in slippery situations and unlocking for tight turning circles and minimal impact on soft or sensitive surfaces. Similarly, the belt-driven Continuously Variable Transmission (CVT) has the capacity to adjust to provide optimum gearing for different situations. The inclusion of high and low ranges plus a reverse gear ensure maximum flexibility and usability.